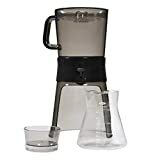 Make your own custom cold brews with our largest brewing carafe, designed to deliver maximum flavor, elegant serving, and cost-effective coffee drinking. It also brews delicious loose-leaf teas! Are you over-spending on expensive cold brews? Is your home coffee machine no longer satisfying? 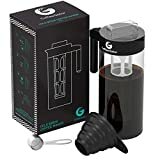 With the at-home cold brew coffee carafe, you can harness the delicious flavor of your favorite coffee beans while customizing your ideal drink. Naturally enjoy the full-bodied taste of cold brew, which boasts 1.5x more caffeine and significantly lower acidity than hot brew. 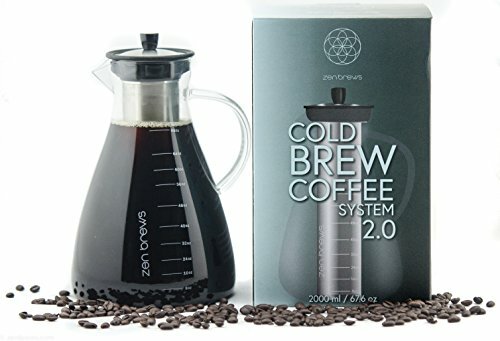 Whether you’re stocking up for tomorrow morning or sharing a batch of cold brew with friends, the Zen Brews 2.0 Carafe is easy to use and produces perfect drinks every time. Simply place your desired amount of coffee grounds in the stainless steel brewing basket to control the intensity of your drink, then let sit 18-24 hours and enjoy! Sleek packaging and elegant product design make this brewing carafe perfect for gifting. Pick up your own cold brew maker today and enjoy the rich flavor of large-batch home brewing!